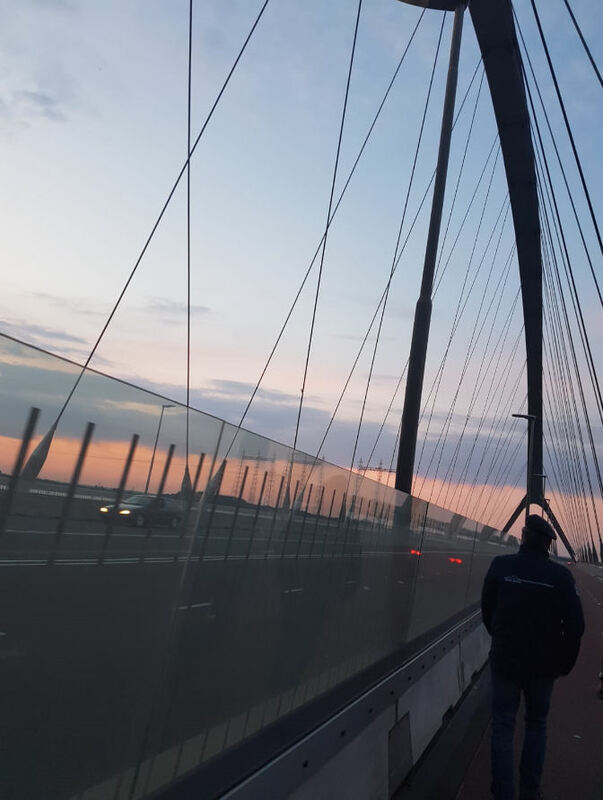 On Monday night 21MAY2018, we attended the 1311th edition of the Sunset March held daily on the new city bridge across the Waal River in Nijmegen, the Netherlands. 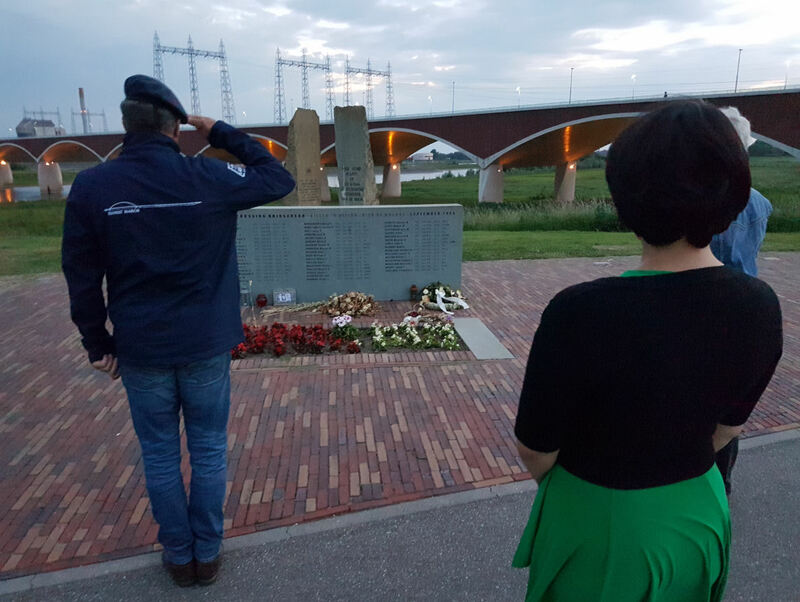 The Sunset March commemorates 48 American soldiers, Killed in Action during the crossing of the Waal river in row boats with the intent to attack the northern approach of the road bridge, leading to Arnhem, during Operation “Market Garden” in September 1944. 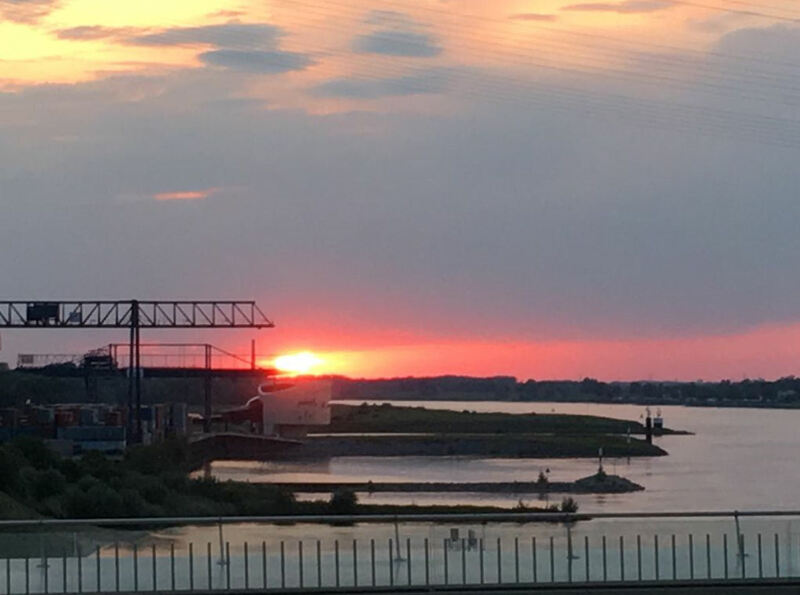 The sun sets behind the power lines of the Nijmegen electricity plant west of the Oversteek Bridge; the start-off point for the heroic river crossing in 1944. At the location of the “De Oversteek (the Crossing)” bridge, on 20SEP1944 the Waal crossing was executed with 26 canvas boats by 3rd BN of the 504th Regimental Combat Team led by MAJ Julian Cook. 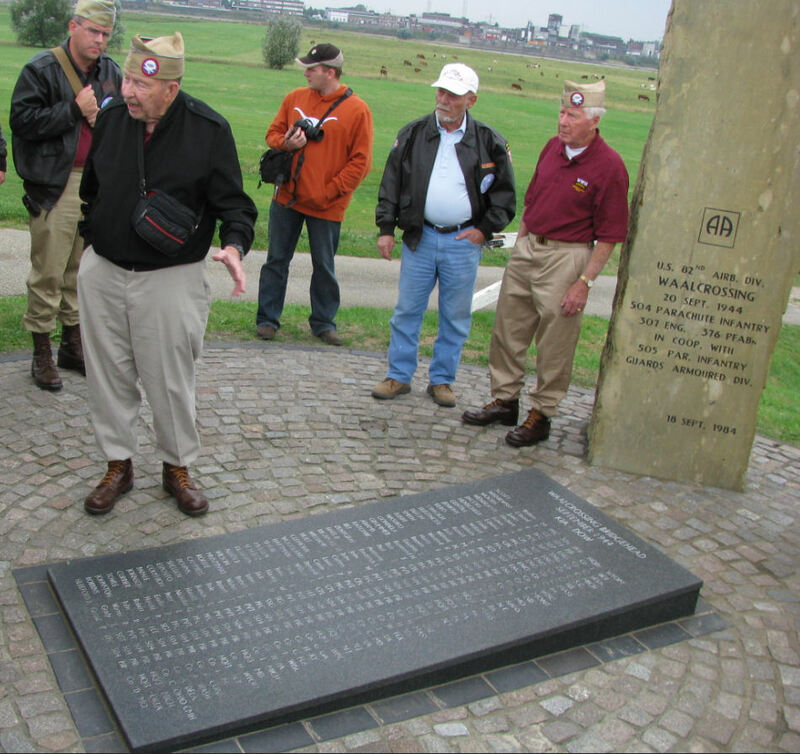 General James GAVIN, CO of the 82nd Airborne Division, had ordered a crossing of the WAAL River during daylight hours so the Americans could outflank the Nazi defenders, who were dug in around the city’s crucial bridges. Cook was put in charge of the crossing, was in the first wave across the river. As COOK’s first wave began their crossing, the Allied bombardment began. The wind blew away the smokescreen, leaving the men in the water open and visible to the Nazi guns. COOK took charge of the boats, redirecting those who were disoriented and pushing the men along. 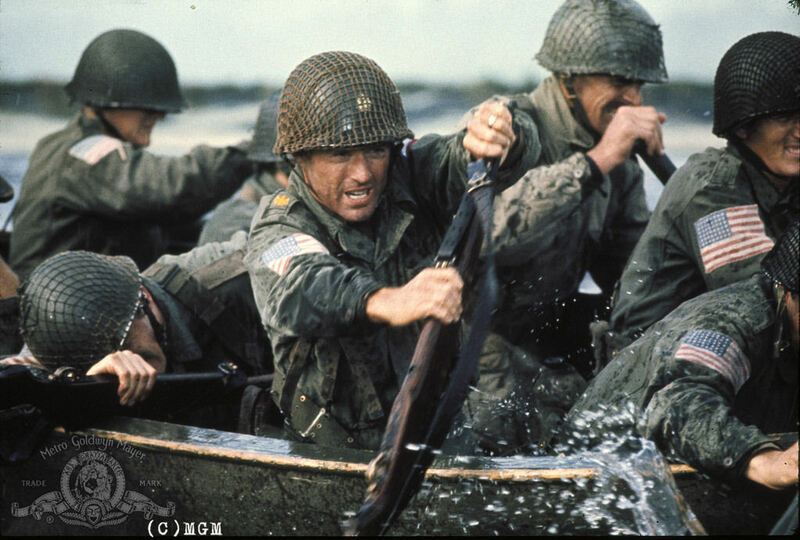 Once ashore, the Parachute Infantry Regiment cleared the river bank and assaulted the highway bridge. 3rd BN, 504th PIR finally captured the bridge at 1900 hours. The 504th RCT was formed from the 504th Parachute Infantry Regiment, the 307th Airborne Engineer Battalion and the 376th Parachute Field Artillery Battalion of the US 82nd Airborne Division. De Waal crossing was further supported by covering fire from the 153rd Field Regiment Royal Artillery and Sherman tanks of the Grenadier Guards. 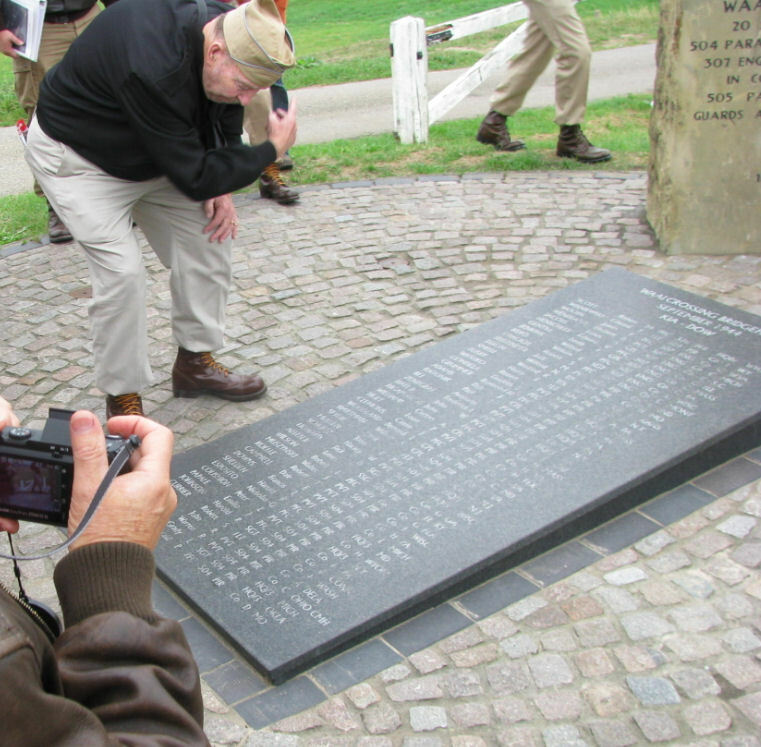 During the Waal crossing 48 American soldiers were killed. 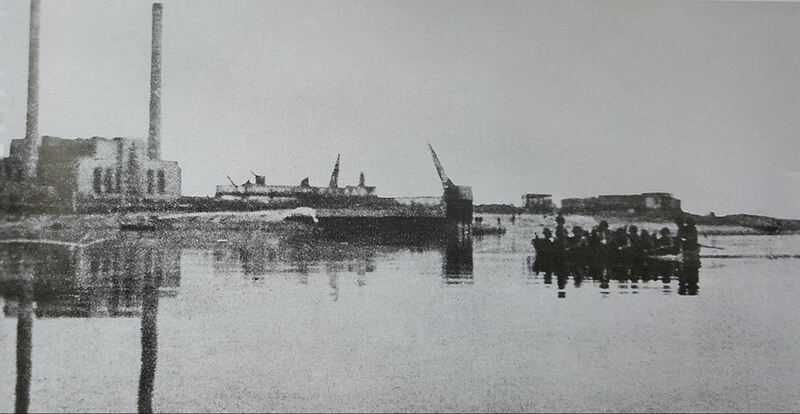 Presumably the only photograph taken of the Waal River Crossing during the event. Page 557 of the 2017 book "Bridges are Ours" ISBN 978-2-9540297-2-6. In our report on the 70th anniversary of Operation "Market Garden" and of the Waal River crossing in 1944, we have described the reenactment of this assault river crossing by active duty paratroopers of the 82nd Airborne Division on 21SEP2014. The city bridge “De Oversteek” (The Crossing) opened in 2013. The location of the bridge marks the exact spot where the Allied crossing of the Waal River took place during Operation “Market Garden”. 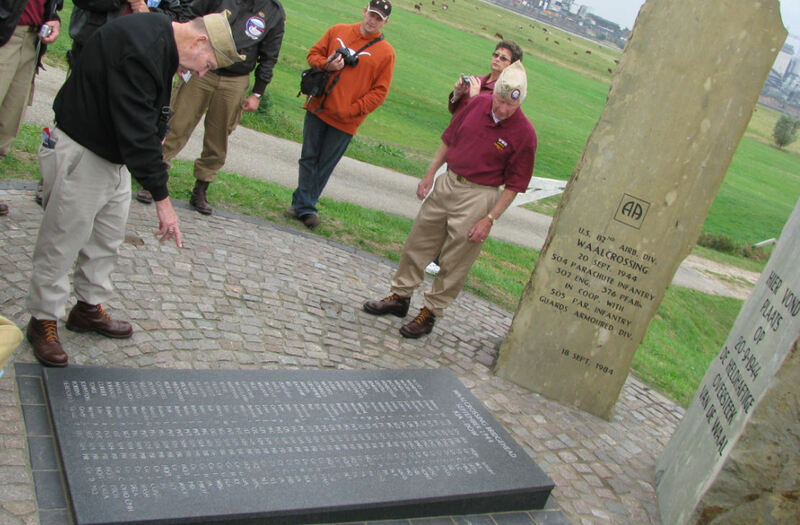 On September 20th 1944, 48 American soldiers of the 82nd Airborne Division lost their lives during this assault crossing. Every day, at the onset of darkness, that crossing is repeated, but now with light: at sunset, the 48 lamp posts between the two river shores turn on one by one, at the pace of a slow march. 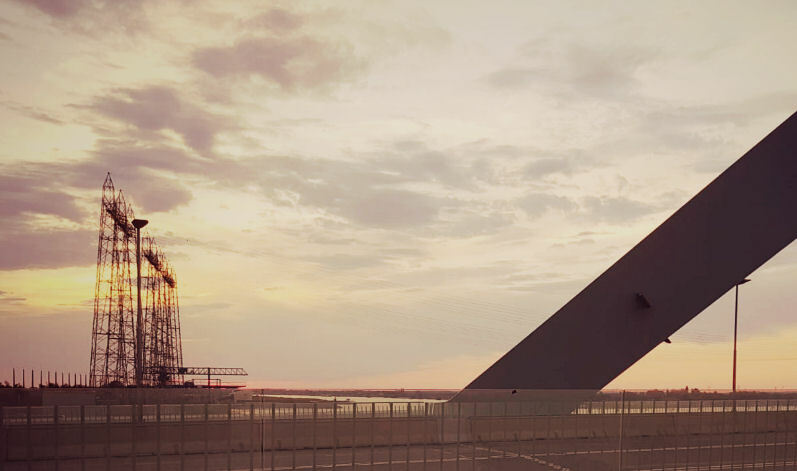 This turns the bridge into both an evocative and a tranquil, subtle monument to the heroic crossing of the Waal River. Only after the 48th set of lamp post is lit; all the other street lights in Nijmegen come on. 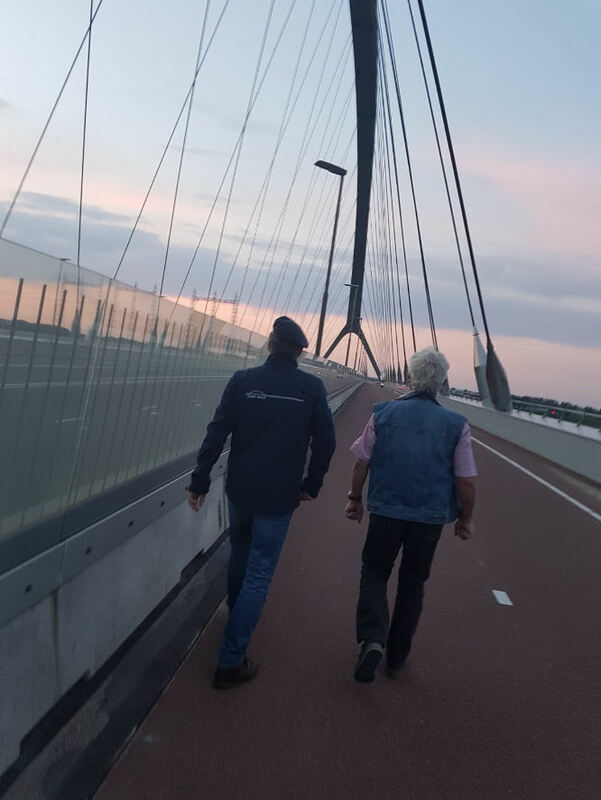 The Sunset March was initiated by the Overbetuwe Veterans in 2014: every evening, at sunset, a Dutch military veteran walks alongside the 48 lights on the bridge as they are switching on. Everyone is always welcome to enjoy which we did on this 1311th Sunset March. 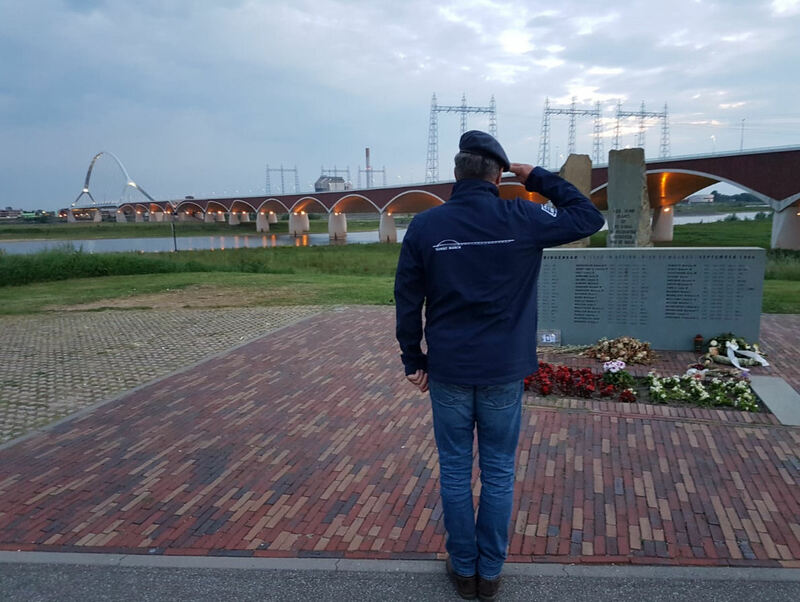 Today, the sun set at 21:31PM and Royal Netherlands Air Force veteran Tim led the way. Upon arrival at the northern ramp of the bridge we witnessed all other street lights in the city light up. 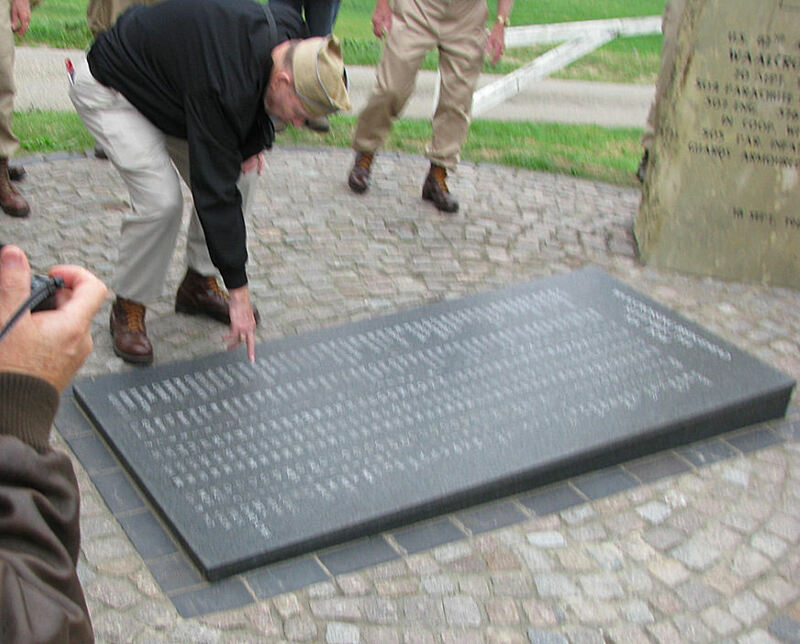 We then walked to the Waal Crossing monument where the veteran rendered a hand salute to honor the men listed on the stone in front of the monument. The Sunset March and the electrical tribute by lamp posts, commemorates 48 casualties, but there are 49 names on the monument. That is the result of an error discovered by Dutch historian Frank van Lunteren and as described by reporter Dorine Steenbergen from local newspaper De Gelderlander during research for her book about the Waal crossing. From Case File #15 we know about the difficulties of putting together an accurate casualty list or Roll of Honor for a specific unit during a given timeframe. New on the monument is the name of radio operator Norris A. Case, who was killed during the crossing, but until recently was not listed on the Roll of Honor. On that list, but wrongly, was Gerald Page Hereford who was Killed In Action later. 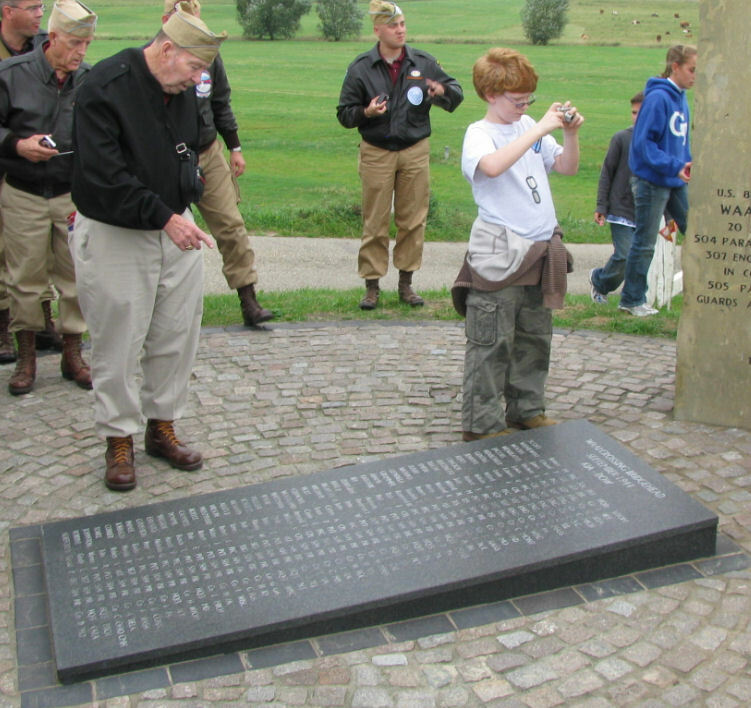 In respect for his actions and ultimate sacrifice Page’s name is still on the new memorial, which now has 49 names and is of different design than the one in the photos taken in 2009. 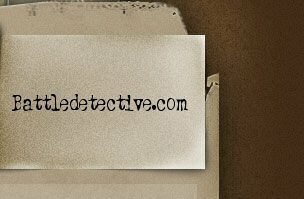 (c) 2007-Present Day Battledetective.com. Email: tom@battledetective.com. all rights reserved.